Amazon Made Me Do It! 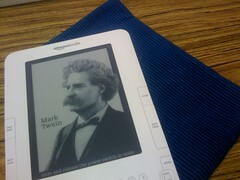 I *never* thought I would want an ebook reader. Never. I love bookstores, and bookshelves, filled with papery-goodness. I love picking up a book and reading the back of it; having a cover grab my attention. I love seeing my bookshelves filled with a diverse selection of books, none of which ever seem to interest me when I’m looking for a book to read. I love actual books. So then why did I buy a Kindle? When Oprah announced it as one of her favorite things it didn’t faze me. When my mom was visiting for the inauguration, we talked about it (at Borders) and I wasn’t interested. Bill has an ebook reader and he really liked it, but he’s a gadget guy. So what, oh what, would possess me to buy one??? Stupid Amazon made me do it. I fell for the propaganda. It just looked so pretty. And it fits 1500 books. In such a small little container. One of the “problems” that Bill and I have when we travel is books. If we go to the beach for a week, we each probably need to bring about 7 – 10 books. At the beach, I generally read a book a day. And it’s happened where I’ve taken out a new book for the day, and finished it at 2, and not had another book to start. That wouldn’t be a problem with the Kindle. And then when we are flying somewhere on vacation, and space in luggage is limited, we are always trying to find space for our books. Plus, there’s the problem of what will I feel like reading? I need options! Bill and I read a lot of the same things so we try and coordinate books that we can both read, but we read at different speeds so that gets hard. Once, when we went to France for a week, I bought us fat classics that would last the whole trip (Hunchback of Notre Dame and The Three Musketeers). That worked, but a lot of times, on vacation, I’m looking for the brain candy. I called Bill to have him try and talk me out of the Kindle. And then I found out he really wanted one but he thought it was too expensive. That led to the guilt. He already knows he likes ebooks. I wasn’t sure I would. He generally doesn’t treat himself to things (like I do with the yarn, and the mani/pedis, and the purses…) So I bought one. For him. But I still wanted one. So I thought about it. And 10 minutes later I bought one for myself. And then I called a friend to figure out how we could rationalize the cost. Our kindles arrived in the mail a week ago. I bought a book, found all the free books on Amazon, bought a couple of books for under $1, loaded a couple of classics from Project Gutenberg and I was set. I do enjoy reading on it. The e-ink is easy on the eyes. I love that I can really easily look up a word in the dictionary. I love that I can have a broad library of books available at my fingertips. It has a lot of other features too, but I really just bought it for the books. What I am not happy about is that it did NOT come with a case, and it didn’t come with any free downloads. It just seems like for the cost, you should get something with it. Even my Coach purses come with a little storage bag. And Bill’s old ebook reader came with a pleather case and some free downloads. I also think that it needs a stand and a remote. I sometimes read sitting at a table and I find myself looking down at it which is definitely not good for my neck or posture. I did pump out two quick cases. I like the design but I am not happy with how these turned out. I was in a hurry and could not get my head around it and how to do it with finished seams on the inside. I think I’ve got it now, but didn’t have the luxury of waiting and taking my time. We heard a couple of horror stories about cracked and scratched screens. Yikes. So that’s something else I am not sure about it – it seems pretty fragile. For now I am loving it. I am reading My Antonia by Willa Cather and I have looked up 3 words in the dictionary. The Maltese Falcon by Dashiell Hammett – fantastic! This book is a must-read for mystery lovers. I love the movie and was amazed by how closely the movie followed the book. Reviewers of this book always comment on the dialogue, and I can see why -it was witty, fast-paced, and the expressions were fantastic. This book is a one of a kind. I will definitely read another of his books, The Thin Man, which is another favorite movie. I am also interested in reading Raymond Chandler who writes in a similar style. Darcy and Elizabeth: Nights and Days at Pemberley by Linda Berdoll – fun! This is the second installment of Ms. Berdoll’s sequel to Jane Austen’s Pride and Prejudice. The book is written in a different tone (Ms. Austen being very proper and innocent while Ms. Berdoll incorporates a little more passion and heat), but the spirit of the characters is the same. I had some trouble getting into this book, but then started to enjoy it. I felt that the book was a little wordy which sometimes got in the way, but it was a fun read, not hard on the brain. The Mediterranean Caper by Clive Cussler – pure brain candy! After reading historical fiction, I was interested in a quick, easy read. I was amazed that the book was written in the 70′s because it reads like it was written yesterday. Dirk Pitt is a fun character – a man who can (and does) do everything. If you’re looking for a quick adventure, pick up a Dirk Pitt novel. In a Sunburned Country by Bill Bryson – funny! This is a travel book about Australia. I don’t read a lot of non-fiction and I’m struggling with the lack of plot. But Mr. Bryson has great insights and observations and I am really enjoying his sense of humor. I’m about halfway through. As you can see, my taste in books is varied. Hopefully one of these will spark your interest. Check back in a couple weeks for Summer Reading Part II. And check out Bill’s blog for his summer reading update. Bill and I love books. Maybe more than we enjoy reading we enjoy book shopping. While at Barnes & Noble Friday night we (okay, I) bought three more books. This started a conversation about the number of books we have in our queue to read and how we probably didn’t need to buy any more books for a year. (This is a common theme in our household with computers, needlework projects, etc.). And this led to our deciding to start Bill and Margaret’s Summer Reading Project. We have tons of books in many different genres and our goal this summer is to get through as many as possible.